Muddy: The Story of Blues Legend Muddy Waters (Atheneum Books for Young Readers) is written by Michael Mahin and illustrated by Evan Turk. As a child, Mckinley Morganfield (1915? -1983) loved to play in the muddy water near his Mississippi home, and his Grandma Della nicknamed him Muddy. He was first introduced to music when he went to church with her, but that wasn’t the music that spoke to him. Muddy loved the blues, and when he was 17 years old, he purchased his first guitar, a Stella. 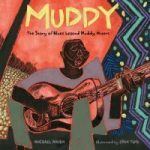 For a number of years, Muddy worked at sharecropping during the week while he played in juke joints on the weekend. These were often ramshackle buildings where African-Americans enjoyed music and dancing because they were barred from white establishments. Eventually, Muddy headed north to Chicago to make a better life. He played in clubs for very little money and kept experimenting with blues that came from his soul. Record producer, Leonard Chess, told him that he had one chance to succeed or fail with his style as he cut a record. Chess wasn’t convinced that anyone would appreciate Muddy’s sound, so he only printed three thousand copies of the record. Folks in the south side of Chicago immediately felt something special in Muddy’s style, and the record sold out in twenty-four hours. Muddy was on his way. Muddy rose from those southern roots where he faced blatant racism and segregation to sing about them with his own Blues.